TRUJILLO, Peru (CNS) — Laughter is the best medicine for religious men and women to overcome the temptation of feeling too important or being too busy to serve others, Pope Francis said. A joyful self-awareness can help those in religious life to not “slack in the work of evangelization” and keep clear from a Messiah complex, the pope told priests, seminarians and men and women in consecrated life from various parts of Peru. “Yes, learning to laugh at ourselves gives us the spiritual ability to stand before the Lord with our limitations, our mistakes and our sins, but also our successes, and the joy of knowing that he is at our side,” the pope said Jan. 20. “The people of God are patient, but they also know who serves and heals their wounds with the balm of joy and gratitude,” the pope said. Priests, seminarians and consecrated men and women are also called be signs of communion and unity, which means to discern what everyone has to offer while respecting each other’s differences. “We must be on guard against the temptation of the ‘only child,’ who wants everything for himself, because there is no one to share it with,” Pope Francis said. “Try to care for your brothers and sisters; try to keep them happy, because happiness is contagious,” the pope said. Elderly priests and religious are “the people of greatest memory,” Pope Francis said. “It is important that our communities keep memory alive and that there be dialogue between the youngest and the oldest,” he said. Saying that older people sometimes feel abandoned, he urged his listeners to send young priests, sisters and seminarians to talk to elderly priests and bishops. “They say nuns don’t age because they are eternal,” he added, to laughter. When the young talk with elderly priests and religious and ask them questions, “their eyes will shine, and they will begin to dream,” he said. 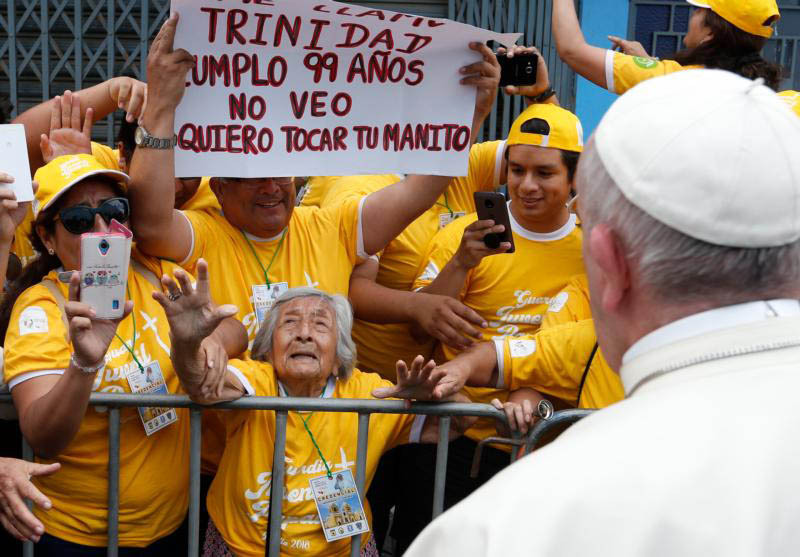 Afterward, en route to a Marian celebration at the Plaza de Armas, Pope Francis fulfilled the wish of a 99-year-old woman, Trinidad, a Trujillo resident who is blind and asked to touch his hand. Pope Francis saw a sign held above her, got out of his popemobile and greeted her.